Wreath-laying in honor of legendary labor organizer Mary Harris “Mother” Jones’ 185th birthday, May Day and marking the official launch of the DC LaborFest. Includes proclamation of May 1 as “DC Labor Fest Day” by the Montgomery County Council and the Maryland State Assembly. The legendary labor organizer spent a lifetime fighting for unions and the rights of workers. She died at the Burgess Farm in what is now Adelphi, Maryland, on November 30, 1930, aged 100 years. The nearby marker in her memory was erected in December, 2000 by the Maryland Historic Trust. Rare chance to see dozens of stunning New Deal-commissioned murals depicting the country’s postal heritage at the former headquarters for the U.S. Post Office Department, now home to the Environmental Protection Agency. We’ll also visit the Old Labor Dept./ICC building (also now EPA HQ), opened under the tenure of the department’s first female Labor Secretary, Frances Perkins, who had her office there from 1934 until 1945. During the tour you’ll learn more about the history of the Federal Triangle complex, including organized labor’s role in the construction of “one of the greatest building projects ever undertaken.” Led by Clark Spencer. Mixed Media: Fiber, rug-hooking , weave stitching , etc. The Triangle Shirtwaist Factory fire in Manhattan, New York City on March 25, 1911 was the deadliest industrial disaster in the history of the city, and one of the deadliest in US history. Susan Berger's deceptively powerful artwork packs an emotional punch in the softest of fabrics, drawing you in to the lives and deaths of 146 garment workers – 123 women and 23 men – who died from the fire, smoke inhalation, or falling or jumping to their deaths. Most of the victims were recent Jewish and Italian immigrant women aged 16 to 23. Because the owners had locked the doors to the stairwells and exits – a then-common practice to prevent workers from taking unauthorized breaks and to reduce theft – many of the workers could not escape and jumped from the high windows. While at Annmarie, be sure to check out the sculpture garden, which includes "A Tribute to the Oyster Tonger, A Chesapeake Waterman" and features many pieces on loan from the Smithsonian, with which it is affiliated. ​Artist Ben Shahn’s stunning frescos are as vibrant and meaningful today as when he created them in 1942. Don’t miss this rare opportunity to see these amazing artworks up close. Originally created for the Social Security Administration’s headquarters, the massive multi-paneled fresco in the Wilbur J. Cohen building (which is now home to the VOA) is entitled “The Meaning of Social Security” and includes “Work, the Family, and Social Security” on the west wall, and “Child Labor, Unemployment, and Old Age” on the east wall. You’ll also get a chance to see a huge mural by Philip Guston, titled “Reconstruction and the Wellbeing of the Family,” in the auditorium at the Cohen building, which is not a part of the general public tour. $10 (benefits DC Jobs with Justice) Sign up here. 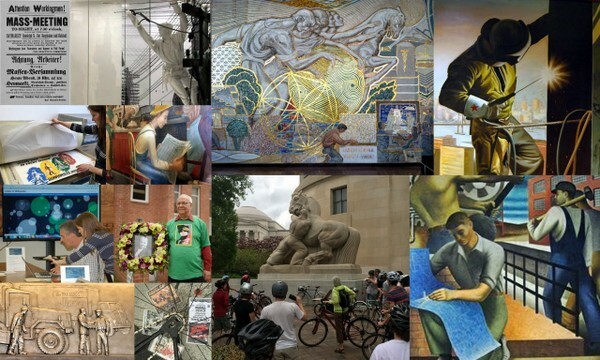 ​A rollicking ride by bike through DC’s history of working-class struggle, the tour will highlight sites and stories of resistance from the distant past to recent events, some memorialized in stone, others paved over and nearly forgotten. Tour pamphlets (complete with a route map) will be provided, as well as a commemorative spoke card for all participants. ​Join a community interested in promoting labor history by editing the popular online encyclopedia Wikipedia. Part celebration and part workshop, Edit-a-Thons are organized around a single topic as a means to build awareness and community. We’ll draw content from labor-related collections at the University of Maryland, including the AFL-CIO Archives. No editing or technical experience necessary. All participants will receive complimentary issues of Labor’s Heritage journal. ​Exclusive guided tour of the Iron Workers headquarters, featuring handmade motorcycles, a wall mural, historic tools, photos, convention paraphernalia, World Trade Center mementos and more! FREE AND OPEN TO ALL; NO TICKETS NECESSARY FOR ADMISSION! $10 per person; benefits Employment Justice Center. Sign up here. From the Labor Hall of Fame to Joe Hill’s ashes, worker’s history is around just about every corner in our nation’s capitol, if you know where to look. This 3-hour walking tour of downtown DC reveals labor’s often-untold story of protest and resistance. Metro Washington Council Union Cities Coordinator Chris Garlock - who usually helps local and national activists make history on DC’s streets - leads the tour. NOTE: it’s an easy 2.5-mile walk but wear comfortable walking shoes and dress for the weather. Tour highlights: AFL-CIO lobby murals; 1953 CIO headquarters; The Real Roosevelt Memorial; Joe Hill’s ashes; Bas relief depictions of labor & trade; 1895 Knights of Labor HQ; Bonus Expeditionary Force & more.